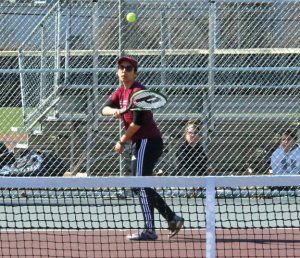 NAUGATUCK — The Naugatuck girls tennis team is giving head coach Jose Sendra plenty to think about. After opening the season with a 4-3 win over Holy Cross and a 7-0 sweep of Wilby, the Greyhounds ran their record to 3-0 with a 5-2 win over Woodland on April 10. The Greyhounds were tied 3-3 with Watertown on April 9 when rain halted the final doubles match, which will need to be played out to determine the winner. Sabrah Cegielski has taken on the No. 1 singles role. Her doubles partner from last year, Catarina Rego, is the No. 2 singles player this season. Sendra went to a couple of new tandems to complete the doubles teams, and all are working out well in the early going. Against Woodland, Catarina Rego earned an 8-4 win in singles play over Kaitlyn Crosby, and Cristina Rego beat Ella Parker, 8-5. Yahna Ancheta knocked off Morgan Swift, 8-2, and Cegielski lost an 8-6 decision to Rachel Poulus. Naugy took a 3-1 lead into doubles. The team of Natalie Paradise and Abby Lariccia won 8-3, and the duo of Adriana Moreno and Alison Bodyk took an 8-4 decision. The team of Brielle Behuniak and Hailey Russell lost 8-2 to Mia Piccolo and Alanna Carasone, the Hawks’ All-NVL doubles team. 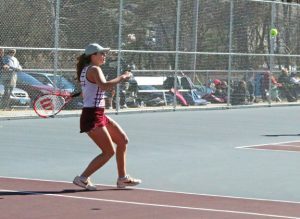 Sendra said the Greyhounds can learn from each match lost. Naugatuck will face defending NVL champion Sacred Heart on Wednesday, before playing St. Paul on Thursday.